We are officially in week two of the Division I wrestling season, and I am still riding that week one wave of excitement. We saw it all a week ago; a Division II school beat Kent State University, Division III national champion Jay Albis (Johnson & Wales) teched two DI wrestlers without allowing a single point, Pat Glory was glorious in his Princeton debut, Evan Wick is good, and Mizzou absolutely owned the border battle with Illinois. We are in week two now, and the stakes are raised as more teams enter the fray. A loss early in the season can come back to haunt a wrestler during a conference or even national seeding meeting. The EIWA will have a mini-tournament at the Bearcat Open this season with five teams listing this Open on their schedule. Expect other teams in the conference like Princeton, Cornell, Army, and Penn to send wrestlers as well to battle it out. Poor George Mason has to feel like the whole league is ganging up on them as they will be carrying the banner for the EWL this weekend. George Mason is working hard to rise up in their conference and after a beatdown on VMI last week and a strong showing at the Hokie Open that netted a champion they are ready to take the fight to some teams to the east. I for one am hoping for the whole Princeton team to show up to the tournament. I want to see guys like Pat Glory (125) and of course Matt Kolodzik (149). And if I am making wishes, I wish that Yianni Diakomihalis (141) shows up and brings Max Dean (184) with him from Cornell. I know the Big Red is sending some good wrestlers, but hey it’s 11:11 and I can wish for whatever I want. Any chance we can get Spencer Lee on a plane, Tom? These early season opens are so hit or miss that it is hard to do real previews. There are times we luck out and coaches answer emails, and the tournament directors put information up early enough that you have time to get the work done. But those are more the exception than the rule. It is a lot of guesswork. We know who will be there from teams like Harvard, Cornell, George Mason, Brown, and Franklin and Marshall. The wildcard is the rest of the field. Here’s hoping that we see the best the EIWA has to offer. Seriously, the only team from the EIWA missing from this that would make it the de facto conference tournament is Lehigh. Cornell, Princeton, Navy, and Penn are all here. We cannot forget Franklin and Marshall, Binghamton, Brown, and Army will be on hand as well. This is a crazy turn out with the Journeyman Classic happening just down the road. Cornell and Princeton are currently tied in the TOM tournament rankings at fourteenth. Depending on who Princeton sends to the party there will be bragging rights on the line, and we will find out who the second best team in the EIWA is at the moment. These two will face off in a dual on February 9th, but until then this will be a battle to reign almost supreme. Navy has some strong individuals, and Penn will have their young talented team in attendance as well. I am really excited to see how Harvard stacks up as well. There could be as many as 14 wrestlers in attendance, more if my wish comes true. Keep an eye on who enters the tournament at 141 and 149. Matthew Kolodzik sets records for Princeton every time he steps on the mat and is well on his way to the title “Greatest Tiger” ever. If he is part of the contingent of wicked smart kids from Princeton, NJ who make the short journey that sets up a possible meeting with 20th ranked Jared Prince from Navy. At 141 we already know that Cornell will not be sending Yianni, but will Navy send 14th ranked Nic Gil? It is never too early to start building a resume for nationals. With all the wrestlers being seeded at this year’s national tournament wrestlers can no longer duck tough competition without a possible penalty later. If Army sends their squad with three ranked wrestlers, we could see some great battles with 18th ranked Rocco Caywood (197), and 7th ranked Patrick Brucki (Princeton). Cornell has entered 16th ranked Brandon Womack (174), but will he have to face 18th ranked Beh Harvey (Army)? At 157 if Luke Weiland is in attendance Army could be in store for a champion at the Bearcat Open. Seriously, handicapping these opens is like wading through a Bill Belichick weekly injury report to set your starting fantasy football lineup. Good luck. Wait, I got one. George Mason, more like George Foreman! They are punching with serious power right now in the EWL. They follow up a tough early trip to the Hokie Open with a trip to take on most of the EIWA. Head coach Frank Beasley enters his second season with a plan to build this team into something substantial, and he is going about it in the right way. Iron sharpens iron, and he is throwing his team against every piece of iron he can find. They made sure not to backslide by taking down VMI to start the season then they crowned a champion and four other place winners at the Hokie Open in Virginia. Matt Voss looks like he is on his way to qualifying for nationals again and transfer Colston DiBlasi found his way to a podium after a rough start to the season against VMI where he jumped up to 174 but did not have the horsepower to compete with Neal Richards. Tejon Anthony will look to build off of his 3-2 performance at the Hokie Open, that left him just shy of placing. I know they are not ready to stand toe-to-toe with EWL champion Lock Haven or top teams like Rider, but they could be by the end of the season. This will truly be another test for them. Can they stand up in the fire and be forged stronger or has their head coach given them enough rope to hang themselves. Young wrestlers live and die on confidence and confidence can be a fragile thing. These are the times when guys hovering just outside the rankings get the wins necessary to jump in. Who are the names to watch this week that could be next week’s waiver wire adds? Start at 125 with Noah Baughman (Cornell) and Nolan Hellickson (Harvard). Either of these guys can take the tournament, and a nice run could put them in the top 20. I hope Army is bringing Lane Peters to take on Vito Arujau (Cornell), the sophomore is 4-1 on the young season and wrestling well. Tejon Anthony(George Mason) is a big win away from jumping into the rankings at 149. Quentin Hovis (Navy) and Fredy Stoker (Cornell) could jump into the rankings if they win the open at 157. How good is Milik Dawkins (Cornell), a first-place finish here would see his stock rise at 165? 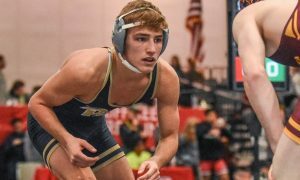 Harvard has a wrestler ready to make the jump in Kyle Bierdumpfel if he can upset Brandon Womack (Cornell) he would make his way into the top 20. The 184 class is going to have some solid wrestlers including, Louie DePrez (Binghamton) and CJ Fragola (Brown). If a guy like Noah Stewart (Army) shows up and turns head, he is on his way up the rankings. Keep an eye on 197, Ben Honis (Cornell) may hope that Pat Brucki (Princeton) and Rocco Caywood (Army) are not in town, but I hope they show and we get to see a battle. At heavyweight, the winner of Matt Voss (George Mason) and Jeramy Sweany (Cornell) will get a boost, but watch and see if Ian Butterbrodt (Brown) enters. There is always someone who goes on a tear and cannot be ignored for the next set of rankings, who is it going to be?